In his "Weekly Poker Hand," @JonathanLittle analyzes a player aggressively playing his combo draw.
.@JonathanLittle examines a low-stakes cash game confrontation between a made hand & a drawing hand. Poker pro and coach Jonathan Little has been producing a wide variety of strategy content for poker players for some time, including authoring multiple books and sharing videos and articles on his website and elsewhere, much of which is free to players of all levels seeking to improve their games. Little started his popular "Weekly Poker Hand" series on YouTube several years ago, and recently he decided to switch up the format to begin featuring footage from live small- and medium-stakes cash games. 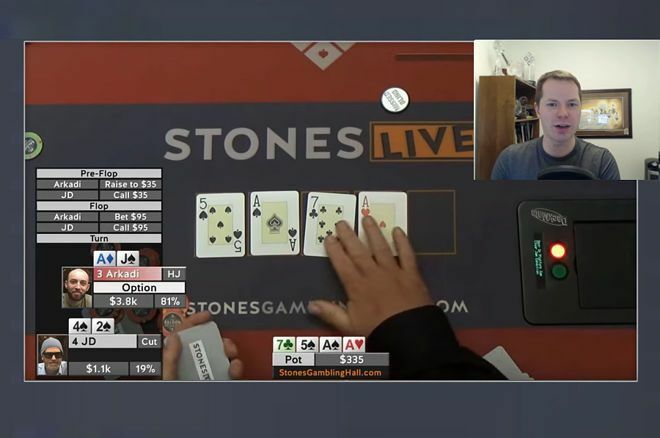 In the episode shown below, Little returns to discuss a hand from a $5/$10 no-limit hold'em cash game played at Stones Gambling Hall in California. In this hand, a player raises and three others call preflop to set up a multi-way situation, then after the flop just two stick around — one with a made hand (top pair of aces) and the other with a combo draw (straight and flush). The player with a pair then makes trips on the turn, setting up an interesting spot for both players. Once the hand is over, Little discusses how the hand likely would have played out differently in a higher-stakes cash game. Jonathan Little is a professional poker player and author with over $6,800,000 in live tournament earnings. He writes a weekly educational blog and hosts a podcast at JonathanLittlePoker.com. Sign up to learn poker from Jonathan for free at PokerCoaching.com. You can follow him on Twitter @JonathanLittle..